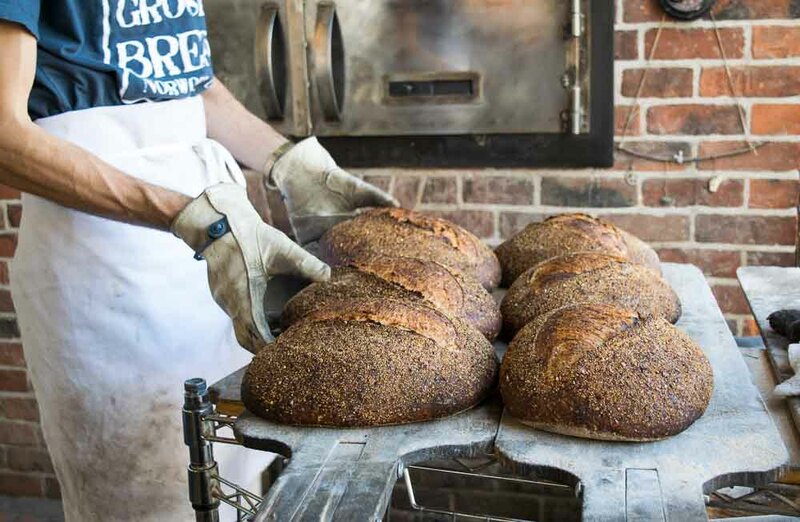 Evrim Dogu works hard to source local grain for Sub Rosa bakery in Richmond, Virginia. Dogu opened Sub Rosa in 2012, and today grinds his own grains to make his assortment of whole grain breads and pastries, fired in a wood oven. Dogu works with local farmers to source heirloom grains like Bloody Butcher and Hickory King corn and winter wheat. But the search isn't easy. Although Virginia lends itself to growing ancient grains like sorghum, oats and rye, most farmers these days grow those crops for animal feed. By seeking out local farmers to supply his bakery, Dogu is working to bring back local grain to the mid-Atlantic landscape. We talked with Dogu about the benefits and challenges of working with local grain. Sub Rosa’s Evrim Dogu tests a loaf. How much wheat do you use at Sub Rosa bakery? We buy about 2500 lbs of grain a month, which all has to be turned into flour. For pastries, we buy pre-milled flour. We use maybe eight bags a week. That’s 1600 lbs a month. Our local sources change for Virginia grains. Last year we were able to get more local grain. Wheat is particularly hard to find because there are not a lot of people growing wheat. Our soft wheat for pastry and corn is about 20% local from a farm in Montrose. But bread wheat and alternative grains, for that we are still looking. Why do you think Virginia farmers aren’t growing local grain? In America, we tend to think in market-based terms. Supply and demand. But we have to move away from the idea that demand is going to drive more farming. It won’t. Bread dough with Bloody Butcher cornmeal. I think it’s a knowledge-based issue. We grew heirloom wheat for centuries and then lost it in 50 years. We’re talking about reintroducing something, a way of farming, that’s been abandoned for 50 years. We need to reintroduce these heirloom grains and growing practices that will make them sustainable for the farmer. For example, a lot of farmers say they don’t have the equipment to grow grain. They need access to knowledge of how to grow these heirloom varieties. How can bakers and chefs change demand? So the math is simple. But when it comes to growing it, farmers don’t have the experience growing grain for human consumption. This is true from North Carolina to Iowa. Farmers are growing a lot of corn and soybeans, but for animal feed, not for human consumption. That can change. Craft bakeries and chefs are looking for a high quality and unique local grain products that will have excellent flavor beyond the norm. What will help educate farmers about local grain growing? In North Carolina, a grain project worked with an ag extension, but in Virginia they weren’t interested. Virginia Tech’s ag program was not interested. They call the seed their own, and they aren’t interested in sharing. They’re also not interested in heirlooms or organic farming. Heirloom is half the yield, and they want Virginia to compete on the commodities market. If someone can put together a “bread lab” on the East Coast, researchers can trial it out and make it ready for farmers. They can breed grains and find what works regionally, then get those to the farmers. This would skips the years of testing famers have to do, to grow the crops and save the seeds. That would be revolutionary for the whole region. There are bakers from North Carolina to Vermont hungry for heirloom grains. Read more about Virginia's heirloom grain movement here. Read more about heirloom Bloody Butcher corn here.